The Coopered Tot: Frapin VSOP cognac delivers floral, citrus, and oaky glory - a small slice of the high end you can rationalize any time. 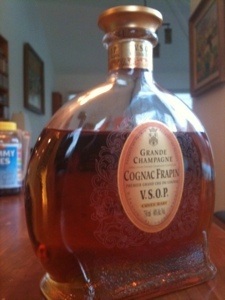 Frapin VSOP cognac delivers floral, citrus, and oaky glory - a small slice of the high end you can rationalize any time. Color - orangy amber - a rich and pretty color but certainly not the rich henna tones of the serious stuff. its lack of age in the absence of cheese (rancio) notes and relative lack of floral complexity - but these are not missed in the drinking; sins of omission; not commission. 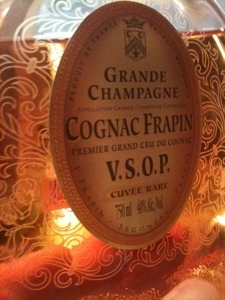 Frapin VSOP makes no mis-steps. What's here is all good. About as tasty a mid-tier cognac ever is. Frapin is pricey for a VSOP. 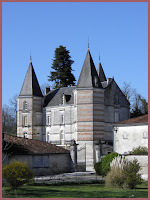 You might be tempted to go for a lesser XO. Don't underestimate the sprightly youthful quality's upside: floral and fruity and somewhat light hearted, Frapin VSOP succeeds.